Let’s face it moms and dads...sometimes, there are things that kids just do better than their parents, and that’s okay! Some of the proudest moments as a parent happen when we see our children excel. Am I the only parent who would love to be a fly on the wall, maybe throw on my invisibility cloak and watch my kids during a typical school day? Are they polite? Do they raise their hands and wait to be called on? Are they respectful of their teachers and friends? Is their desk messy and gross, do they clean up and follow directions? Are they the talker in class? What's great about The Day My Mom Came To Kindergarten is that it's not the student causing trouble, it's the parent proving yet again that kids are better at certain tasks than their parents. This is a wonderful book for little ones getting ready to attend a school setting and it doesn’t necessarily have to be kindergarten, preschool children would understand this book as well. It's a great way to enforce the dos and don'ts of school without harping on them and allow them to grow more comfortable with what they'll be doing at school. Meet Luca, and his magical eyelashes. He blinks twice and they grow long to help him be brave and strong. As is common practice, Luca is due for a well-visit and needs a shot but finds himself a bit apprehensive about the doctor’s office. Lucky for Luca, he has those magical eyelashes and some encouragement from his mommy and the staff at the doctor’s office. He gets through his visit with no tears and a clean bill of health. Luca Lashes Visits the Doctor is the sixth book in the Luca Lashes series aimed at reader’s ages 0-4. It is a continuation of the Luca Lashes series of books dealing with children’s first experiences such as first dental visits, first haircuts, and swimming lessons. There is even a “Suggestions for Parents” page in the back of the book with neat tips and great advice to help your children cope with upcoming first milestones. Did you know that the Luca Lashes series is available in Chinese, English, French, Italian and Spanish? There is a whole team of people behind the scenes that help make each Luca Lashes story come alive. There are currently 18 books planned in the series with more to come in 2014. I encourage parents to check out the Luca Lashes website, it’s a ton of fun, very educational, and there are even apps available for download to enhance the reading experience. An adorable baby bear cub and his mama spend some quality time together sharing snuggles and, of course, some chunky sugars. What are chunky sugars you ask? Well, I’m sure you've shared enough of them with your own cubs, those sweet smooches you can never get enough of. So what does our adorable baby bear cub and his mama like to do you ask? Well, they like to play outside, swim with the fishes, and eat all the honey and blueberries they can find. Mama also loves to share those special chunky sugars all over her chunky baby’s cheeks, fluffy head and feet. So when you read Chunky Sugars to your little cub, be sure to dish out all the sugar you can, but don’t forget to count those hearts, look for bee’s and say a quick hello to Mother Nature while you’re at it. Oh, and watch out for those new baby teeth, they hurt! Chunky Sugars is an adorable book written by Sara Banard who happens to dish out chunky sugars to her own chunky babies. Joshua Stolte is the man behind the adorable illustrations in Chunk Sugars that have an eye catching, 3D like quality to them. They are fun to look at, but not overwhelming for your little ones. They also offer a wonderful way to introduce new words to your children’s vocabulary with images of bee’s and fish, hearts and hugs, even teeth. Chunky Sugars is the perfect introductory book for your own chunky baby, and whether you call them smooches, kisses, planting a smacker or a chunky sugar, you’ll appreciate the message behind this adorable book. Notice that there is no author listed for this book. That’s because there isn't one. Flood is a completely visual experience for readers. It doesn't need words; its impact is that powerful. This book is recommended for readers ages 6-8 and I definitely agree with this rating. I wouldn't recommend Flood for younger children unless a parent sees fit. Flood deals with a very real, possibly disturbing event that younger children might not understand or will interpret differently than intended. This book teaches us an invaluable lesson. Mother Nature, while beautiful, can show her fury. Natural disasters can’t be stopped and are usually devastating. Personal belongings and effects washed away, ruined. Never to be recovered again. What’s more important than the storm itself is what happens when the worst of it clears. When we witness communities come together to help one another rebuild their homes and businesses, schools and hospitals. Cleaning up the community, shaping up the community, striving to make it better than it was before. That’s a powerful message to send to children. I personally feel this is a very wise book to share with young children, especially ones old enough to understand the impact that Sandy had on the East Coast of the United States. The storm coverage for Sandy was intense and emotional, so consider taking the time to explain to little ones that there is always the potential for something positive to come out of something so negative. 5 bright shiny apples for this gem of a book! If you’ve got yourself a picky eater at home, No Ordinary Apple is a definite read. First, let’s start out by meeting Elliott, a handsome young boy who desires an afternoon snack after a long, ordinary day at school. He’s appalled when offered an apple as a snack, he’d prefer, as most children probably would, some sugary sweet junk good. From there, we follow little Elliot on a tasty journey where he discovers there is more to that ordinary apple than meets the eye, and ear, and nose, and mouth. No Ordinary Apple is more than just a book about eating mindfully; it’s a book about engaging one’s sense’s when eating food, trying new foods, or giving foods that was once deemed unlikable another chance. This book is brightly illustrated with lively pictures and vibrant colors. The cover drew me in immediately. The illustrations are so interesting that you readers will likely stay on a page to admire the handiwork of Mr. Pascuzzo long after reading the text. And while this book is meant for children 4 and up, younger children can easily appreciate the story and graphics as well. Publisher: Sourcebooks Jabberwocky, an imprint of Sourcebooks, Inc.
A smiling mother stands on the front porch of her family home with the beloved family dog and waves goodbye to her children as they find their way off to school. Touching imagery of course, but what was left out of that description is something to which parents can all relate. Imagine that same mother but with frazzled hair, a ragged old housecoat and only one slipper situated on her foot. That is the image displayed on the opening page of Oh, The Things My Mom Will Do. In Miss Richmond’s newest book, we read the story of a typical child who cheerfully goes to school without their lunch kit, misplaces toys, forgets Important school assignments until the day before its due and, of course, spreads worms out onto the carpet. Through it all is an amazingly wondrous mother who is always there to chase after the bus in her jammies, sans slipper, to make sure her child has lunch. A mother who loses sleep while making a special costume for a school play and makes pet invertebrates a home inside her home. She also finds teddy before bed, makes it to the party on time, and at the end of the day, is there to tuck you in and say goodnight. A mother’s work is never done and often goes unnoticed. Sometimes, when life feels rushed and hectic and Junior really does forget his bear in the grocery store shopping cart, mom has to search through every single cart in the corral before it shows up…these are the moments that mom’s might chalk up to as an “experience”, but it’ll be a moment in time that a child will remember forever. Maybe even a story to tell their grandchildren one day when expressing their love for the older generation of family members, all because mom managed to save the day…again. 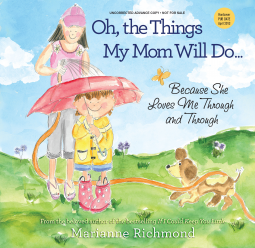 Oh, The Things My Mom Will Do is a remarkably illustrated, poignantly written hardcover children’s book with recognizable experiences that will tug at any parent’s heart and resplendent imagery that will occupy a child’s mind. While this book is meant for children ages 4 and up, a child of a younger age will also be able to perceive the imagery and possibly tell the story through pictures. The author is able to show children that they shouldn't take their mother for granted and understand that even in her absence her thoughts are always on the well-being of her child. Did you know that Miss Richmond’s last two books sold more than 226,000 copies? Not too shabby! Her other works include, If I Could Keep You Little, I Love You So, I Believe in You and many many more. You can find them at independent book stores, Barnes and Noble and online sites such as, www.Amazon.com, available for pre-order. Are you and your family planning to spend some time outdoors? Do you have a young child who desires to understand the sights and sounds they might experience, or the activities they can participate in while outdoors? Well, look no further because you can teach them all about the great outdoors and their ABC’s with Camp ABC: A Place for Outdoor Fun. Zora and David Aiken have made this book double the fun for parents and young readers. Not only can children learn the alphabet, but they are also introduced to the many activities and animals the outdoors has to offer. A perfect example of this is the letter ‘K’, which is for kayak. We are treated to a lovely rhyming verse and the image of two happy children paddling the waters in their kayak, surrounded by deer, fish, raccoons and mice. “A kayak’s a fun boat. A true camping adventure book with detailed illustrations and tons of ideas for a family getaway into the wilderness such as leaf tracing, rafting, star gazing, and even napping just to name a few. 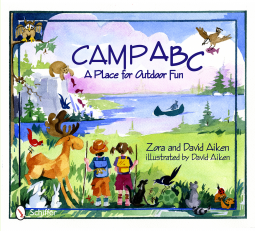 You can pre-order Camp ABC: A Place for Outdoor Fun on several online sites. Check below for a link to Amazon. Go to your local bookstore, or check an online site for Zora and David’s other collaboration, A to Z: Pick What You’ll Be. Pre-order available - publishers website. Is there a book you'd like to see reviewed on this site? Are you an author, illustrator or publisher interested in having a book reviewed? Please email me at enchantingCBR@gmail.com with your requests. Thank you. Images and book quotes on this blog are copyright to their respective owners. . Watermark theme. Theme images by UteHil. Powered by Blogger.